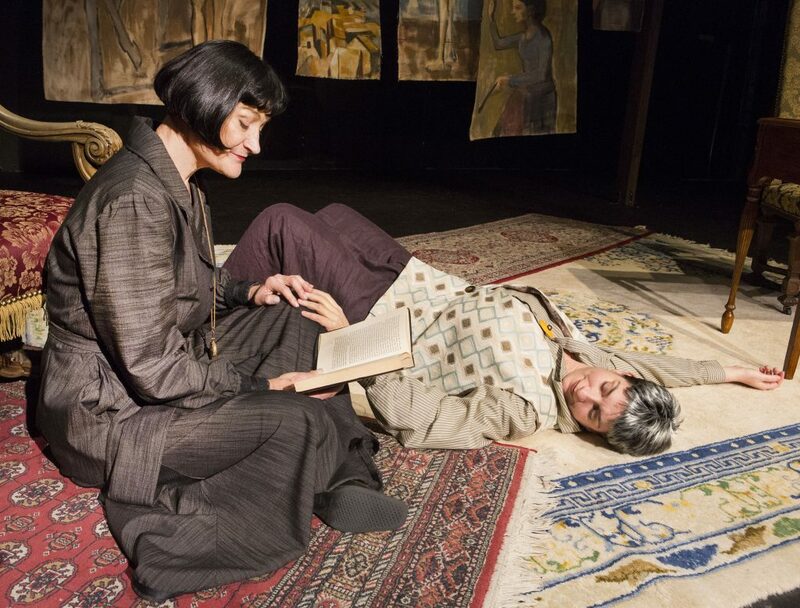 “Gertrude Stein and a Companion” Alive in Paris, at Theatre Rhino, S.F. 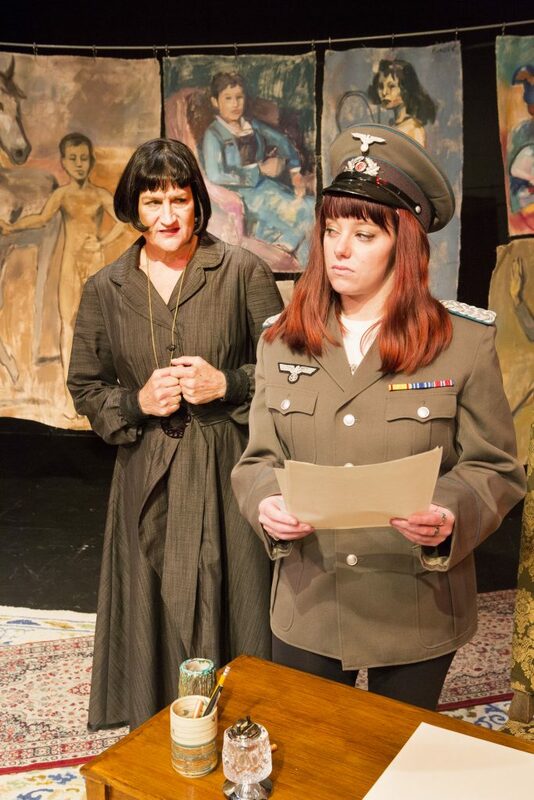 If you are fed up with the current political scene, Kardashian pop culture, and anti-intellectualism, escape to a sweet world of love, paintings, and ideas, courtesy of Gertrude Stein (Kathryn Wood) and Alice B. Toklas (Elaine Jennings) at Theatre Rhinoceros, through Sunday, January 8, only. In Win Wells’ play “Gertrude and a Companion,” Gertrude and Alice, in their Paris salon, recall their extraordinary life together. As they share memories and much laughter, the depth of their relationship becomes clear. We learn how Alice took over management of the practical side of their lives so that Gertrude could write, read, entertain, buy paintings, and shine.We learn how their commitment to one another resulted in one of the most artistically productive, and yet loving, partnerships of modern times. Gertrude and Alice hosted many artists and travelers at 27, rue de Fleurus, Paris between 1902 and 1938. These visitors came to see the walls covered with the avant-garde cubist and impressionist art that Gertrude bought and displayed. It is to be noted that they came, also, to eat the dinners prepared by Alice. And, of course, when the visitors left, Gertrude wrote some of the most inventive and startling, if challenging, literary works of her time. We get to eavesdrop on Alice’s pain in doing a “murder” when she has to clean a carp for Picasso’s lunch. We learn the silly nicknames each has for the other. We enjoy Gertrude’s confusion at just which wife that Hemingway was fighting with that day. Gradually, more significant memories occur. We watch Alice learn the art of publishing and learn how she gets Gertrude’s first book published. We see how Alice’s appreciation of Gertrude’s work helps the writer persevere, despite the scorn of others. Whatever the memory unfolding, always we enjoy the company. And we get to marvel at the Picasso paintings. In 1933, The New York Times called Stein’s Paris salon “the First Museum of Modern Art.” Here it is beautifully imagined with a clothesline full of unframed famous canvases—including Picasso’s “Portrait of Gertrude Stein”—all hanging as a backdrop. There’s Matisse, Cezanne, and lots of Pablo, all great friends of Stein and Toklas from the beginning of the twentieth century. Kathryn Wood gives us a perfect Gertrude Stein, capturing both Stein’s writing style and sound-cadence, while personalizing her written words. Wood has studied her Gertrude’s physicality, sensibility, and her love of Toklas. 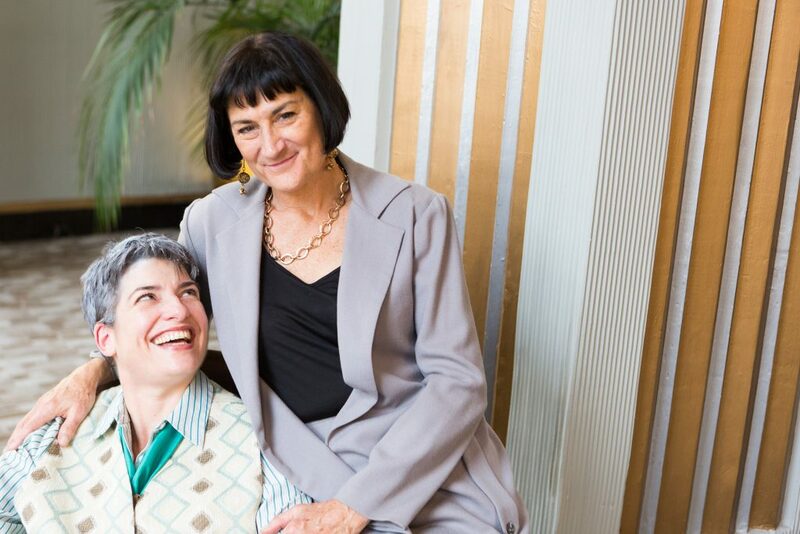 Elaine Jennings may be a tall Toklas, but she manages to evoke the direct, sharp manner. Jennings becomes Alice in black bangs and black dress, invoking Alice’s “Spanish” disguise. Haley Bertelsen plays “Everybody Else” credibly, including obnoxious U.S reporters, Hemingway, Leo Stein, and the Nazi major who was forcibly billeted with these two American Jewish women in southern France during World War Two. In the years of the Paris salon, Alice was regarded by many as simply Gertrude’s unnamed companion. As much as we have come to respect Alice’s unlocking the door to Gertrude’s success; we recognize, too, that Gertrude is quite possibly the genius she and Alice claimed her to be. Yet, as Gertrude reminisces, we see that she is a down-to-earth woman. We hear her pride as an American, a most open and democratic pride. She is a clever, generous host who laughs easily. This play, intelligently directed by Wood and John Fisher, is a love story between two brilliant women who were soul mates, two people who were fortunate enough to find and complete one another. No lives are without tears or suffering, so we experience some of their pain too as time passes. But you will enjoy your time in their company, and will be sorry to leave – especially to return to 2017. Fortunately, something of the essence of their lasting love will walk out into the street with you. There is wonderful memorabilia of the two women in the lobby–don’t miss it. Cast: Kathryn Wood as Gertrude Stein. Elaine Jennings as Alice B. Toklas. Haley Bertelsen as Everybody Else. Note: Too much happened in the lives of Stein and Toklas to capture in one play. Consider this play as a catalyst to read The Autobiography of Alice B. Toklas by Gertrude Stein. Behold Stein in medical school and learn why her French cook didn’t like Matisse. And maybe it’s time for a walk up to City Lights Bookstore and their Poet’s Corner? Finally, now that recreational marijuana is legal in California, it’s time for some of us to revisit The Alice B. Toklas Cookbook for that recipe for hashish fudge. 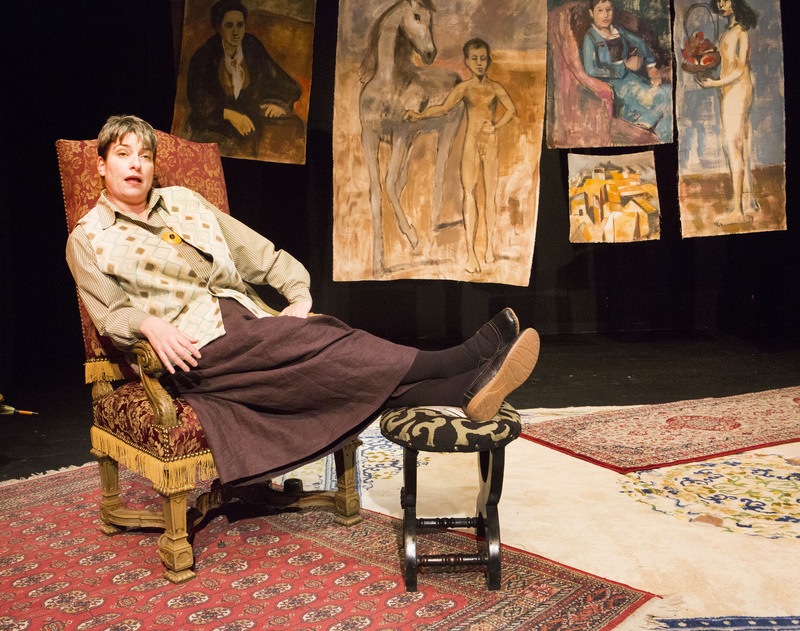 “Gertrude Stein and a Companion”: The Logic of Love at Theatre Rhino, S.F.